1) Procon.org gives you a sense of commonly debated social issues along with critical perspectives. 2) Official ACT rubric with detailed explanations. 3) An example of a high-scoring essay. 4) Instructions and form for requesting a copy of your actual exam (including an image of the essay). So, obviously, in this lesson I'm gonna be talking about the most recent scoring system. Then we'll look at how your scores are determined. We'll talk just really quickly about what this item, this ELA score refers to. 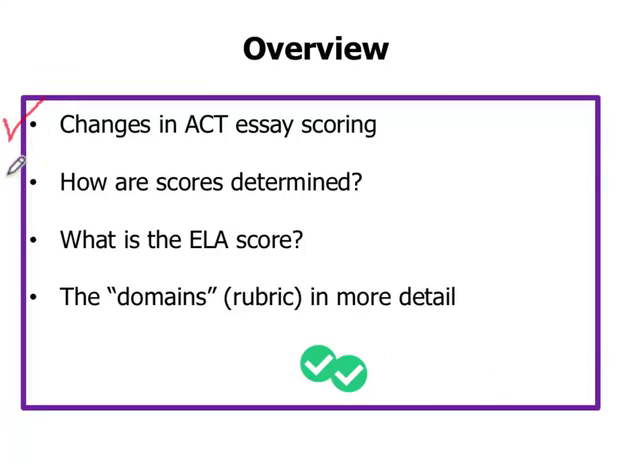 And then, we'll go over the domains, which is essentially the rubric that the graders use when they're scoring your essays, look over that in a fair amount of detail. The ACT essay scoring was most recently updated in June, 2016. Prior to 2014, the ACT essay was graded on a scale of 2 to 12. Then for a short period of time they switched it over to a 1 to 36 scoring system. And they did that so it would be consistent with the other four sections. But it didn't, there were some problems with it, basically, because the four multiple choice sections are like scaled scores. And they're really well thought out in advance and they are kind of designed to some what follow a bell curve. Whereas the essay it is a rubrics system, it is a different way of, it's qualitative. It's not the same deal as a multiple choice section. And so they went back to this 2 to 12 scale in June of 2016 in order to kind of make it clear that this is its own thing. You can't really compare the essay to the rest, and also the essay doesn't even factor into your composite score, the essay as we know is optional. Okay, so that was a little bit of background, but this is really the more important part. How are the scores determined? Okay, it's all on a rubric, and so very similar to how your high school English teacher might, or history teacher might grade an assignment, a paper. So we have domains, we have four different domains. We're gonna talk about each of these in detail later in this lesson. And then there are two graders, the graders don't know each other, they don't talk to one another, or they probably live in different states for all we know. Grader A is gonna give you a score of 1 to 6 on each of these four, and so it's Grader B. And then, essentially, the scores are averaged, but I'll sort of show you step by step how that happens, okay. So hypothetically let's say these are the scores that each of the graders come up with. Graders A score added up to 12, Grader B's added up to 14. And then, those scores are essentially averaged, so they're divided by 4, so 12 divided by 4 is 3, 14 divided by 4 is 3.5. But the ACT does not have half points on the essay, and so a 3.5 would round up to 4. Okay, so now one essay writer gives a 3, the other one gives a 4, 4. Those two scores are added together to produce a score of 7, and that would be your score for the essay. What about a situation like this? So here we see that Grader B was far more generous, and the scores are quite different. A 13 versus an 18, well, whenever their is more than a one point difference in this last row here. The ACT just brings in another grader, a third grader and then the three sets of scores are averaged. So I said before that a score of 6 is a fairly average score in this current system. But just in case you're curios here you can see just sort of breaking it down, what the actual percentiles look like. And what I find particularly striking about this is that you'll see that almost all the scores are a 6, a 7, or an 8. Like 75% of students are gonna get one of these three scores. So we would say from a statistics point of view, that these grades very highly clustered in the middle with long tails, okay. So a 6, 7, 8, if you get 7 one time and then on your next test you get an 8. Might not seem like much or a jump, but that is a huge jump when it comes to percentiles. What is that ELA score? Basically, if you write the essay you will also receive an ELA score. So you do get your one score on a scale of 2 to 12, that's your main score. Your writing score, your essay score, but you get another score, a score of 1 to 36. The ELA is calculated through your English reading and writing scores. Their weighted averages, and they haven't been able to find the formula. So I'm not sure is it mostly your writing score that comes in and second English and just a little bit reading. I'm not sure the exact formula, but they basically look at your three scores English reading and writing. And then they come up with some form of weighted average. And neither the writing nor the ELA scores factor into your composite score. So if you really don't do well on the essay, that's not going to affect your composite score at all. All right, so here's the layout of a score report you might get. In the top right hand corner, you have whatever for photo you submit when you register, you have a submit a photo of yourself. And your composite score is here, this is gonna draw your attention. This is where you're probably gonna look first, what was your composite. This is probably the second most important because it has your Math, Science, English Reading. And this is where your writing score will appear, somewhere between a 2 and a 12. On this side you get your National and State Averages. And then this is just where they kind of break it down by question type. And this is where your Writing Domain Scores will show up. You won't be able to see your two graders, you won't know if there was a discrepancy or anything like that because they just average it all in together. Some students wanna know can I view my essay later? The answer is if you want to see your ACT exam, and that would include a photo of the essay, when you register, you need to pay $20 more. And, and this is pretty important, you need to make sure that your testing date is enabled for this option. I've included these links here, and they're also pasted below this lesson window. But last year it was like I think about a third, a quarter to a third of the testing dates were in enabled for this option. So if you paid an extra 20 bucks, you could go back and see how did you answer each question and what did your essay look like, okay. Finally, let's look at the domains in more detail. Ideas and analysis, this is hard, you can't learn it overnight, it's a thinking skill. The graders, when they're looking at your essay, and they're thinking this through. They're asking themselves, are your ideas relevant and high quality? Are you thinking critically, and do you understand your audience? What will help you with these first two is basically just to read a lot. Read and also just listen to the news, multiple stations not just one, read intellectual magazines. You don't have to read a whole article to get benefits. You can read the introduction and conclusion to different magazines. And you'll actually pick up quite a bit both in arguments and also tone style. One site Kristin and I recommend is Procon.org. And Ive linked it below this lesson if you want to check it out. You can read about perspectives on controversial issues. Almost anything under the domain they have on this website of education, thats a great place to look. School uniforms, how many times have I seen that on standardized tests? That would be a good one, Student Loan Debt, Banned Books. I mean, our Magoosh example actually uses that sort of. It would be funny, wouldn't it, if they had one on standardized tests? But I just grabbed this from the website, so this is just what they were talking about on the day that I looked at the website, in June of 2018. I also just grabbed the couple from entertainment and sports. I could imagine these three coming up, Social Media, Video Games and Violence, Obesity as a Disease. So check those out, I think it has a great list of topics that are likely to come up as well as perspectives on them that are critical. This last part here, do you understand your audience? Your purpose and audience are always gonna be the same, they are the people who are evaluating your essay. One thing I really, really urge against do not include childish hooks. For instance, this person writes, have you ever wondered who actually produced addictive products like cigarettes? No, you don't wanna say anything like that, not that tone, not actually even the details that are listed here. Think about it, so you're readers are mostly educators and editors between the ages of maybe 30 and 70. A lot of them have advanced degrees, pretty mature. It's safe to assume that all of them are very aware of the tobacco industry. Your teachers had good intentions, I'm sure when they taught you to include hooks like this, but this is a great time to drop them. You definitely don't want to use that on the ACT because it would count against this aspect. It would show that you're not talking to your audience. Development and support, are your examples specific and relevant? Do you analyze your examples and discuss their implications? I think the most important words here are specific, and also analyze. A lot of students don't realize just how specific and how detailed they need to be when they are talking about their examples. To learn more about this, check out our Magoosh lessons on, How to wow the graders, and also body paragraphs. Organization, if you score high in this area, you effectively demonstrate your ability to guide your reader through the essay with paragraphs, topic sentences, transitions. And also present your ideas in a logical order or sequence. For one, it means having multiple paragraphs. You don't want to write just all stream of consciousness, and all one big blob. It means creating an outline that has a very intentional order. There's a reason why you list the first one first, and the last one last. And to get more practice and insight into this, you might wanna check out the Magoosh lessons, planning your essay and How to structure your essay. Last, language and conventions. If you score high here you have the proper grammar, syntax, mechanics, style, and tone. This category rewards students for purposeful word choice. Most of your essay scores come from just being kind of mechanical and orderly. But if you really want to sparkle, if you want a high score, you need to choose your words carefully. It means being intentional, having a sort of aesthetic value, mixing up your rhythm, throwing in a little irony, some flourish. It's actually part of the fun of writing, it's part of the skill of writing. To get some tips here, I suggest you check out the Magoosh essay lessons. The importance of style, Top grammar rules, and also Proofreading. The last suggestion I have for you is to go ahead and download the official ACT Writing Test Scoring Rubric. There's a link below the video window here, and what you'll see is that they go through, like starting with a Score 6. And they say what does that look like in each of these four domains? And how does that differ from a Score 5? And, of course, they go through four, three, two, one as well, but it's helpful. It's also really great if you are trying to get some feedback on your writing. You can give this handout to someone because it will give you some pointers, and really help you focus, and plan your practice strategies.